Why is Plantskydd Repellent the #1 choice of Professional Growers? • PROVEN by independent research to out-last and out-perform all other repellents! • EFFECTIVE against deer and elk. • RAIN-RESISTANT—no need to re-apply after rainfall or irrigation. 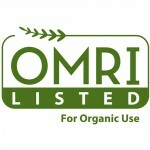 • ORGANIC—first animal repellent OMRI Listed by the Organic Materials Review Institute. • BONUS—built in fertilizer results in bigger, healthier plants! Is Plantskydd safe to use? Yes! Made in the U.S.A. Pronounced: plant-skid, it contains no synthetic additives, is non-toxic, and is not harmful to animals or the environment. Plantskydd is Swedish for ‘plant-protection. Plantskydd’s active ingredient has long been recognized as an organic fertilizer. 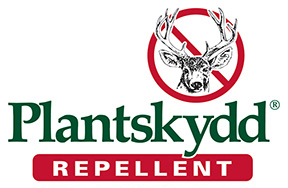 How is Plantskydd different from other repellents? Unlike other repellents that quickly lose their effectiveness after irrigating or rainfall, Plantskydd is rain and snow resistant. It does not require immediate re-application and is now the #1 animal repellent choice of professional growers, foresters, and landscapers. Why does Plantskydd work so well? “Plantskydd repels by emitting an odor browsing animals associate with predator activity—stimulating a fear-based response that will have garden feeders looking for somewhere else to dine. Research* has proven odor based repellents are more effective than other repellent systems. Animals avoid plants before they bite—not after! Made from (porcine or bovine) dried blood*, vegetable oil, and water. An EPA exempted, minimum risk* pesticide, and is exempt from Federal Insecticide, Fungicide, and Rodenticide Act requirements, specifically under Section 25(b). The EPA has determined… the use of these* pesticides poses insignificant risks to human health or the environment. The agency…is responding to society’s increasing demand for more natural and benign methods of pest control. Is it okay to spray repellents on all flowers? Yes! Plantskydd can be be used on flowers. It will darken leaves-petals temporarily. They will return to their normal colour in a couple of days. For sensitive plants (e.g., roses) we suggest you test samples before treating large numbers (wait 24 hours). To prevent leaf-petal curl, water plants well at the roots before treatment. If petals curl on test plants, rinse with a fine spray of water and dilute Plantskydd solution further. If I have a clogged sprayer, what should you use/do? Flush the sprayer dip-tube and head with water (warm/hot preferably), until all dry pieces of repellent are gone. To prevent future clogs, always shake repellents vigorously before spraying. Shaking the product ensures that the active repellent ingredients, which have settled to the bottom, go back into flowing solution before the sprayer is activated. With only flowable material going into the sprayer, you can significantly reduce clogging in the dip tube and sprayer head. Be sure to rinse the sprayer after each use. How can I protect fruit trees? Whips—if you’re planting fruit tree whips, dip them in Plantskydd solution before planting, or coat the whips using a paint brush. Then spray trees when leaves have formed. Mature trees—treat prior to bud-flush, or 2-3 weeks after. Avoid treatment while buds are forming. Treatment over foliage is enough to deter browsing herbivores. Will Plantskydd hurt my dog? Some users have reported that the family dog is quite enamoured with Plantskydd when it is initially sprayed on plants. It will not harm animals, but it’s best to leave Fido inside, until treated plants are dry (1-2 hrs). How often do I need to treat my plants and trees? • For best protection, treat plants before browse begins, in spring or fall. • Always treat new growth—until plant has reached full size or leaf-out. • Plantskydd liquid formulation lasts up to 4 months on dormant plants. • IMPORTANT—spray liquid Plantskydd on dry plants—allow to dry for 24 hours. • Plantskydd is rain-resistant and does not require re-application after irrigation or rainfall. • Ideally, spray in the morning or late afternoon, when the sun is not as strong. Will Plantskydd® work in areas with heavy rainfall / snow? Plantskydd repellents are rain resistant and long lasting, even in wet weather. How long after spraying does Plantskydd need to dry? Allow Plantskydd liquid spray formulation to dry for 24 hours prior to watering plants or rainfall. If it rains within 24 hours of application, it should be reapplied. Can you spray repellents on wood, vinyl, concrete, etc ? Do not spray liquid repellents directly on wood, vinyl, concrete, furniture, fences or other building surfaces. To protect building structures, use a granular repellent as a perimeter barrier. How should I store Plantskydd? Protect from heat. Store in cool, dry, dark location. Keep from freezing. KEEP OUT OF REACH OF CHILDREN AND PETS. • Soluble Powder Concentrate (mix your own)—lasts 5+ years in its original package. Tightly re-seal unused powder. • Ready-to-use Liquid—use within 3 months of opening the sealed container. Plantskydd is a 100% natural, organic product and will start to go off in warm weather. Once mixed into solution, use within a few days. Apply unused solution as a fertilizer. **IMPORTANT – to prevent clogging, remove sprayer head and dip-tube and flush out between uses.